It's a two-cup of coffee morning. Our good friends, Mike and Mel, arrived on Friday evening and yesterday we had a busy, busy day. Bill is off to the flying field this morning - but the fog is thick so I doubt that he will be able to fly. Mike and Mel are sleeping in. We took our friends to one of our favorite places to walk, Six-Mile Cypress Slough. 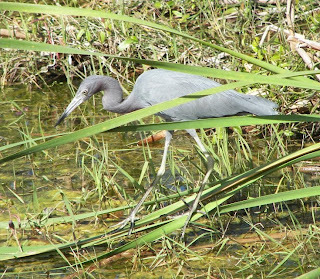 This Small Blue Heron was looking for breakfast. 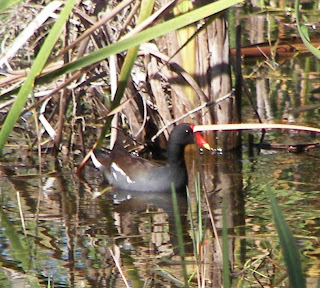 This is a Common Moorhen - also called a Mud Hen or Pond Chicken. They can certainly make a racket! 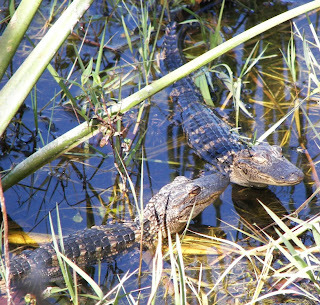 These cute baby alligators seem to be whispering sweet nothings to each other on this beautiful Valentine's Day morning. We also saw a huge alligator off in the distance and a big snake swimming across one of the ponds. The turtles were everywhere. One of them had high centered on a log and was trying to get off - with no success. We also saw a number of Ibis pecking, pecking, pecking in the shallow water and heard the Osprey overhead shouting their need for love. After our walk we went to Jason's Deli for lunch and a huge glass of ice tea. We've been there a couple of times and it is always very good. Bill is recovering from a nasty cold - that I'm hoping NOT to catch - so he spent the afternoon napping while Mike, Mel and I headed to the pool. The afternoon started out with a clear blue sky - but by the time we turned into prunes, it had turned grey. It was still warm and we were chatting up a storm so we hardly noticed. After a quick dip in the hot tub to warm our core - we walked back to the condo. Last evening Bill and I were treated to Italian at one of Mike & Mel's favorite places - Starz. They had told us about this great little Italian place just down the road - and we assumed they were referring to Il Pomadoro on Gladioulus. On what we thought was their glowing recommendation - we've been sending family and friends to the wrong place. Good thing they are both good!